The Vice-President Yemi Osinbajo, made the disclosure in Dutse on Tuesday when he paid a courtesy visit to Emir of Dutse, Dr Nuhu Sunusi. 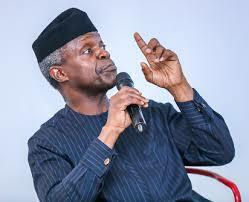 Osinbajo said the petty traders would be given either N5,000, or N15,000 or N20,000 to enhance their respective businesses. ‘‘We are here today in order to deepen our work with common man, because our major concern is how to improve the life of common man in Nigeria. ‘‘So, I want to assure you a minimum of 30,000 traders will benefit from this programme. ‘‘In the first instance, a trader will be given N10,000 loan, after settling that it will be increased to N15,000 and up to N20,000,’’ Osinbajo said. In his remarks, the Emir thanked the Vice-President for the visit. ‘‘We thank you for coming to explain to us what the Federal Government is doing to assist the common man in Nigeria. ‘‘We’ve seen the difference already, particularly with regard to women empowerment and school feeding programme, ’’ the monarch said. He, therefore, urged the beneficiaries to make good use of the money to enhance their businesses. The News Agency of Nigeria reports that Osinbajo was in Jigawa for a one-day working visit, and he would launch some empowerment programmes initiated by both the federal and state governments.